HANG ON LESTER CHAMBERS…HELP IS ON THE WAY! At first I was annoyed when I got hundreds of notifications that the lead singer of THE CHAMBERS BROTHERS, Lester Chambers, had tagged my photo on Facebook. Then I read the cardboard sign (above) and wondered why he didn’t contact me sooner! 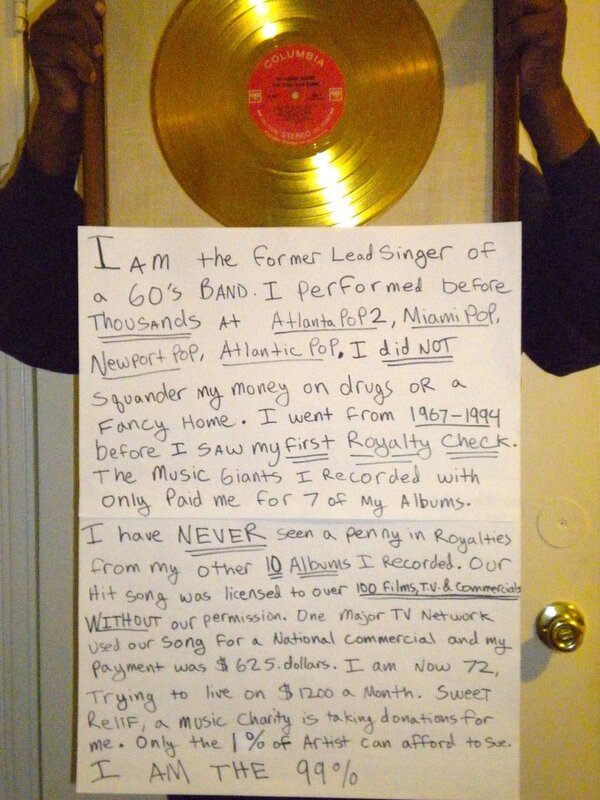 I’m facing a similar situation with getting paid for the cuts of mine that Michael Jackson recorded. It’s hard to believe that Michael’s estate earned 350 million dollars since he passed away, while I earned less than $5000, from my songs on posthumously released albums that contain some of his biggest hits! Lester is right, only about 1% of those of us who’ve been screwed can afford to sue, like Lester I’m one of the 99% who can’t, however I have an idea. Lester’s post got an astonishing 7,264 LIKEs, 1,416 COMMENTS, and 5,888 SHARES on FACEBOOK in the last 48 hours, and could kick start the campaign to start some “CLASS ACTION AUDITS” going! HAVE YOU GOT A SIMILAR HORROR STORY ABOUT GETTING SCREWED IN THE MUSIC BUSINESS? WRITE YOUR EXPERIENCE IN TWO PARAGRAPHS OR LESS IN THE AREA FOR COMMENTS BELOW THIS ARTICLE…AND MAYBE YOU’LL FIND JUSTICE. SPECIAL THANKS TO HUNTER GEORGE FOR SUGGESTING TO LESTER CHAMBERS TO GET IN TOUCH WITH ME.